I was going to use this as an article for the front page of the Mallala Crossroad Chronicle. It was too long though, because if I was going to use it there, it would have to have photos, and it would have taken up at least one and a half pages. Instead of that, I’ve decided to put it on this blog instead. It’s part of who and what I am. I live in rural South Australia, on a small property with the four dogs, and I watch the birds when I have spare time, and if feel like sitting aroung on the veranda, front or back. You see, in my spare time, I am a twitcher, or birdwatcher. I know there are twitchers who take this role far more seriously than I, but there you are, I’m perhaps a casual or spare-time only twitcher. A report on the avian activities for the afternoon. Birdwatching from the seat on the front verandah I’ve seen more native birds than non native ones and I find that to be a huge win for the session! Native birds – the first seen for this session was a crested pigeon. It seemed it was going to use our new bird bath, but only walked around it and near it before strolling off, head nodding, to have a drink from the old bird bath. Then it flew away, with that characteristic call, so beloved of small children, who delight in chasing them off, so they’ll do the call! After the crested pigeon was a small group (5) of white-lined honeyeaters who all flew into the odd bush we have which is about 5 metres from my seat. They then left the bush and all drank from the old bird bath before splashing in it briefly before flying into one of the pine trees. 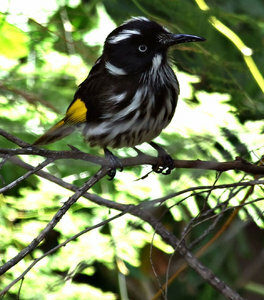 It was the other honeyeater species next new holland honeyeaters. A frolicking little flock of them went merrily from bush, to pine tree, to old bird bath. They briefly stopped on the edge of the bird bath before the six of them jumped into the water for a fun splash, fly off, return and splash again. None of them drank the water, they just splashed and bathed in it. A sparrow joined them at the old bird bath, but he only had a sensible sip and then he flew away. I was having fun watching them frolic, but they flew away from bird bath to bush, to pine tree and then gone. I thought that was it, but joy of joys, oh my is that? Yes it is! A crimson rosella landed in the old bird bath, then another and then another! Oh wow, how wonderful is that!? These three gloriously red parrots bathed and then sipped and the bathed again. I stood up to go inside to tell my husband, hoping they wouldn’t disappear, so he’d be able to see them too. The three of them flew away from the old bird bath, but only flew the few metres to the pine trees, and they were still there when Graham and I were outside again. I’d brought my phone with me an took some snaps, but don’t know if the parrots will be visible. Finding out will be a task for tomorrow. As it turned out, the photos were no good, but this is a close up picture of what the bird looks like. I couldn’t get as close to the wild birds as this one is whoever is the person feeding it. That’s probably the end of this bird watching session, except to mention the willie wagtail I both heard and then saw on the road just both of our driveway. I can hear a bird cheeping too, but that’s almost certainly a non-noteworthy sparrow. Ah though, speaking of sparrows, I did see more sparrows from time to time, mostly taking a few sips, then flying off and mostly male ones. There were a male and a female though who both bathed, and I saw some white lined honeyeaters do the same toward the end. That’s all, it’s time to go inside with the other two humans and the four dogs! Today galahs are the main thing with the birds. I was out on the front veranda chatting to a friend on my phone tonight, and was watching and listening to the galahs as I chatted. We have 6 tall pine trees along part of our front fence, and it seems the pine cones must have pine nuts in them. This season, flocks of galahs fly in and try to get at the pine nuts, knocking the pine cones off the tree, and trying to get at the nuts on the ground. The galahs were there tonight, and they also took advantage of our two bird baths. I had an interesting show, and thought this would be a good further note to this blog post. And I took a photo, so I’m able to put up one of my own pics, as well as the others.